With the arrival of my Rachel’s Organic parcel and the chance to try their new fat-free range I decide to embark on a muffin making afternoon. You can’t go wrong with muffins. Ok, so it might be defeating the object of buying fat-free, but you can use yogurt in lots more ways than just as an accompaniment to granola, or eaten as it comes from the tub. Muffins are practical and versatile. You can make them sweet or savoury, fill them with cheese, bacon, or any kind of sweet treat from fresh or dried fruit to luscious home-made jam. They make a great breakfast, a healthy lunchbox addition or just the perfect accompaniment to a cup of tea (I love my tea and cake, in all its guises!). Muffins are also more filling and substantial than a plain old fairy cake. The fact that they are somewhat heavier makes them more akin to bread; a little mini loaf in a cake wrapper. Having said this you do still need to take a bit of care when mixing. A heavy hand produces a rather solid mass of bun, not the light and airy one that you are aiming for. The other thing about muffins is that they positively demand you add yogurt. It is this that gives them their distinctive less sweet and slightly sharpish, taste. 225g plain flour, 2 teaspoons baking powder, a pinch of Halen Mon seas salt, 100g caster sugar, 1 medium egg, 125ml Rachel’s organic low-fat natural yogurt, 125ml milk, 75g unslated butter (melted), 150g lemon curd. Line a muffin tin with 12 cases and preheat the oven to 180 degrees C / gas mark 4. Mix flour, baking powder, salt and caster sugar in a large bowl. Combine the egg, yogurt, milk and melted butter in a jug and pour on to the dry ingredients mixing very lightly until just combined. If you over mix you will get those heavy muffins that you want to avoid. Add the lemon curd a few dollops at a time and marble in to the mixture roughly. Again avoid over stirring. Spoon the mixture into the paper cases and bake in the oven for about 30 minutes or until golden brown on top. Transfer to a rack to cool and eat, preferably while still warm, but they should keep for a day or two as lunch box essentials for nine-year old boys! Use the same recipe as above but substitute 125g of fat-free peach and passionfruit yogurt for the natural yogurt and a large well mashed banana for the lemon curd. All the other stages remain the same. You could also use the blackcurrant yogurt along with a handful of blueberries, or black currants when in season….or the strawberry and rhubarb with a tablespoon or two of freshly cooked pulped rhubarb (which is now in season)…most importantly once you have that basic recipe to follow, let your imagination run wild, what could go wrong!! 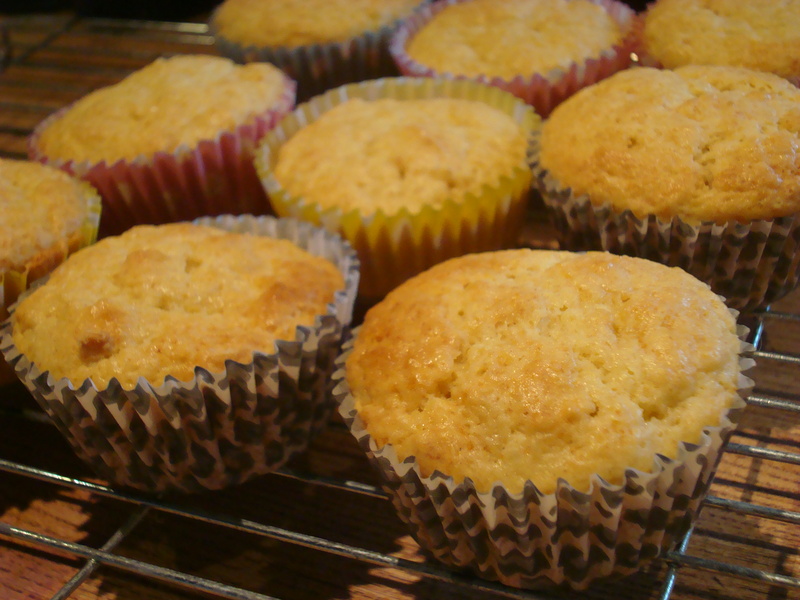 Rhubard muffins…cor! They sound nice. You don’t get those in Starbucks.